The International Journal of Health, Wellness, and Society offers an interdisciplinary forum for the discussion of issues at the intersection of human physiology, epidemiology, and its relation to medical public policy, health education, and the cultural associations of well-being. The concept of “health and wellness” impacts all members of society, whether at a personal level in the positive senses of healthy behavior and increased preventative care, or problematically, through the cost and availability of remedial healthcare. Contributions to the journal range from broad scientific, sociological, philosophical, and public policy explorations to detailed studies of particular physiological health issues and social dynamics. We welcome case studies and research that utilize primary and secondary data to advance important theoretical issues affecting the sociology of international health. The International Journal of Health, Wellness, and Society currently has a 46% acceptance rate, based on 2017 statistics. We are working to change the way in which knowledge is produced, validated, and shared within member-based Research Networks. Review scores are based on a clearly articulated rubric, and the result is a peer-review process that is scrupulously fair in its assessments, while at the same time offering carefully structured and constructive feedback that enhances the quality of the published article. Each year a top-ranked article from The International Journal of Health, Wellness, and Society receives the International Award for Excellence. We are committed to expanding the visibility, reach, and impact of research from the Health, Wellness, & Society Research Network. 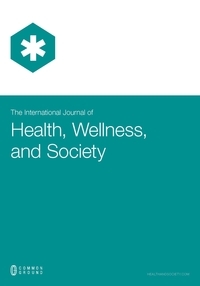 The International Journal of Health, Wellness, and Society can be found in numerous databases, accessible via the libraries of institutional subscribers, and in the CG Scholar Bookstore for current Research Network Members. We take seriously the “peer” of “peer review.” Decisions of what is published come from reviewers that are Members of the Research Network ensuring the knowledge is validated in horizontal social knowledge relations. A publishing process that is without prejudice to institutional affiliation, stage in career, national origins, or disciplinary perspectives. If the article is excellent, and has been systematically and independently assessed as such, it will be published. Authors and reviewers, as Research Network members, gain subscriber access to the journal collection ensuring that the product of their labor is also accessible to them. Articles can also be made Hybrid Open Access if authors wish, at a rate that is fair, sustaining open knowledge while balancing the labor of author and publisher. Crossref is a not-for-profit membership organization for scholarly publishing. Crossref and its members work to make content easy to find, link, cite, and assess by using online tools and services to improve research communications. Crossref's goal is to be a trusted collaborative organization with broad community connections; authoritative and innovative in support of a persistent, sustainable infrastructure for scholarly communication.